With the recent unveiling of this years Topps Allen & Ginter set I thought that an actual vintage A&G would make a good "Card of the Week". Above is my 1887 N28 Allen & Ginter card of master shooter and rifleman Annie Oakley. It's far from being in mint condition, but at least I can say it's mine. You too can be like Manny by driving Manny's ride. 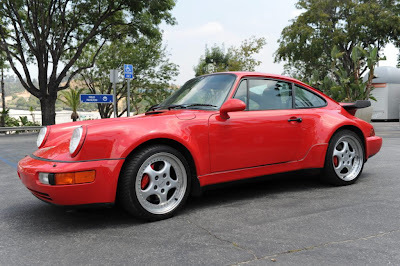 He has donated his 1994 Porsche 911 Turbo Coupe 3.6 to ThinkCure! 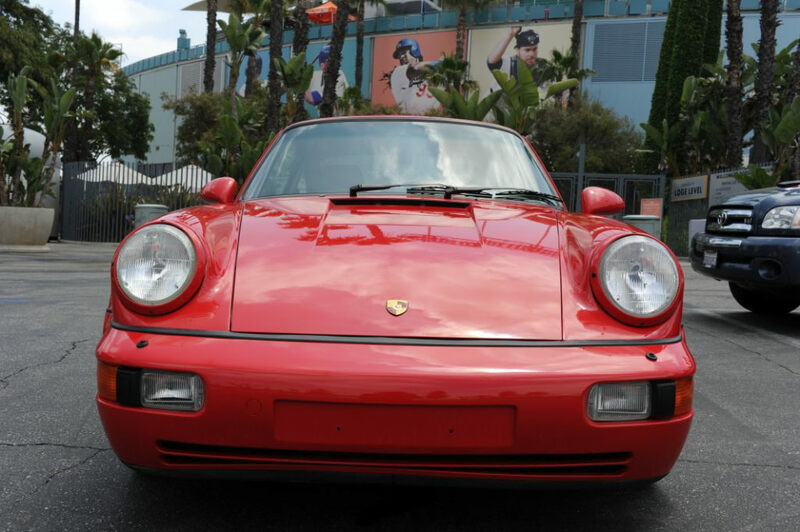 Dodger outfielder Manny Ramirez has donated a rare 1994 911 Porsche Turbo 3.6 to be auctioned off for charity, the team announced today. Proceeds from the online auction will be split between ThinkCure!, the Dodgers’ official charity, and Maryvale, a local residential placement home for girls formerly known as The Los Angeles Orphan Asylum. The online auction will take place at www.thinkcure.org/manny and will run from tomorrow, July 2 at 11 a.m. through Monday, July 12 at 11:00 a.m. The 1994 red 911 Turbo coupe with grey leather interior has logged just 34,569 miles and was recently appraised for more than $58,000. Porsche released the 964 Turbo 3.6 in January, 1993, featuring a turbocharged version of the 3.6 litre M64 engine and producing 360 PS (260 kW; 360 hp) @ 5500 rpm. The 3.6 litre powered Turbo was produced only for model year 1993/1994, with fewer than 1,500 of them produced in total, making it one of the rarest and most sought after Porsches produced since the 959. Ramirez donated the car to ThinkCure!, but it was also his desire that the proceeds be shared with a center that specifically helps displaced children. Per his wish, half of the proceeds will be given to Maryvale in Rosemead , a local residential placement home for girls which originated 154 years ago as The Los Angeles Orphan Asylum. It was established by the Daughters of Charity to care for the growing number of orphaned children living on the streets of the then-El Pueblo de Nuestra Señora de Los Angeles . 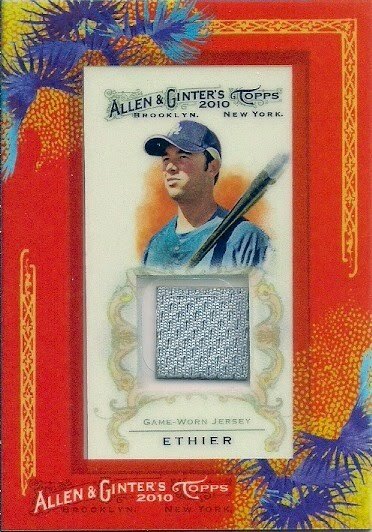 As you may already know, Topps 2010 Allen & Ginter Baseball card set is officially out. This is one of the more popular, and one of my favorite, card set franchises they have ever produced. It consist of numerous inserts, mini cards and oddball non-sports subjects. They mimic the vintage design of the 1887-1888 Allen & Ginter tobacco card sets. 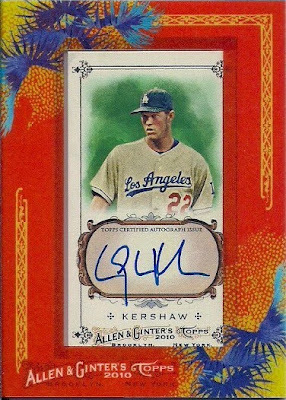 Over the next few days I'll post up as many different Dodger cards as I can muster, so stay tuned. I'll start with some notable Dodger inserts. Here are the 2010 This Day in History insert cards. They feature a players birth date and a historical event that occurred on that day. Only 3 Dodgers are in this subset. On Andre's birthday, April 10, the first 3D film premiers. On June 16th, Jonathan Broxton's birthday, Coney Island opened America's very first roller coaster. It was called the Railway Switchback. On Manny's birthday, May 30th, New York recorded its very first car accident. Is this a bit of unwanted commentary on the part of Topps? For the game-used relics Topps Allen & Ginter places the mini cards in a red bordered plastic frame. I guess they don't want you to damage the card. Only two Dodgers are featured- Matt Kemp and Andre Ethier. They also frame inserted autographs. Below is the Clayton Kershaw, but the Matt Kemp and Andre Ethier cannot be found in packs. They only provide a redemption card, so no picture is available at this time. Roberto Clemente should have been a Dodger. He was originally signed by the Dodgers as an amateur in 1952, and even played for the Montreal Royals, the Dodgers Minor League affiliate, a couple of years later. Unfortunately, the Rule 5 draft came along in November of 1954 and the Pirates stole him from us. Of course, if we had just placed him on our regular roster instead of trying to hide an obviously talented kid in the minors I wouldn't be complaining now. Below is a actual game-used Baseball glove once worn by Clemente available for viewing and auction at this years All-Star Game Fan Fest Hunt Auction. 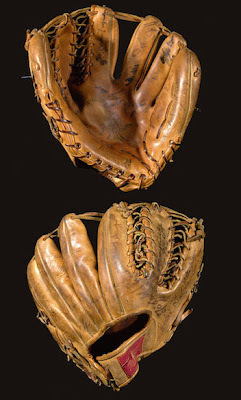 Game used memorabilia from this Hall of Famer are very rare. 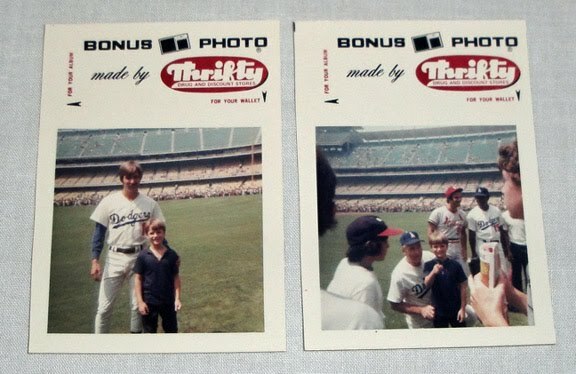 A couple more fan photos popped up on eBay recently. They were taken in 1974 before a game against the Cardinals and feature a young kid with Ron Cey and Walter Alston.